The president of the BCA Richard Brown has proposed that all associations collectively seek a meeting with the CHRE after the BCAs vote of No Confidence in the GCC. I had to laugh when I heard that one, it shows how little he knows. I started trying to make complaints about the GCC in 2002 when Richard Brown was in training to be Margaret Coats poodle. I complained to the Department of Health, The Privy Council, the CHRE and they all tell you the same; take it up with the General Chiropractic Council. Thats what “Statutory Self Regulation” means the chiropractic profession regulates itself. So you make a complaint to the GCC as I did about Greg Price; Margret Coats and Peter Dixon conduct an “investigation” which might involve counting the chocolate chips in their cookies over a coffee. Then the complaint is filed away and there is nothing more anyone can do, until there is a new Chief Executive and chairman who conduct an investigation into the activities of Greg Price and Coats. 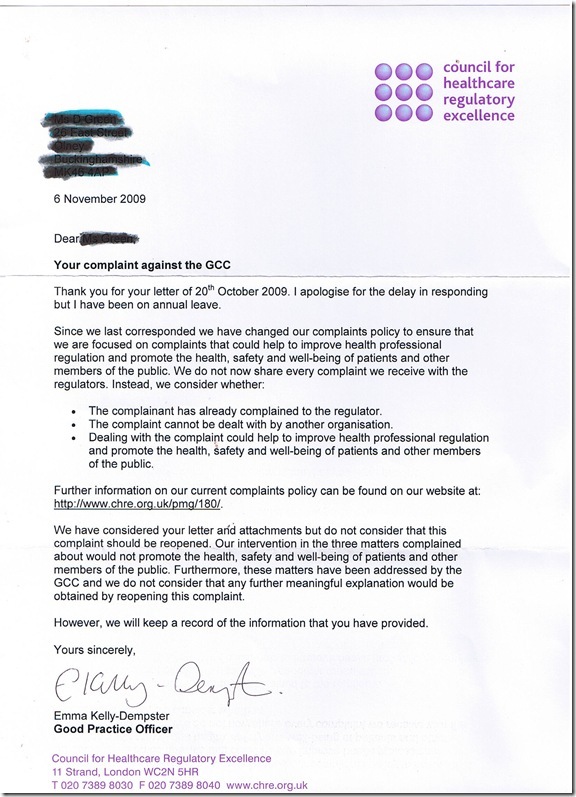 If you complain about the Osteopathic Council they have an independent process for investigating complaints against them which is the way to do things if you have nothing to hide. I am not calling Peter Dixon chairman of the General Chiropractic Council a liar, but…. The GCC and other regulatory bodies are answerable to parliament so the only people they have to answer too are MPs. Thats why when Jim Devine MP started asking questions about bullying allegations in the Nursing and Midwifery council the registrar had to go and the CHRE stopped giving them glowing annual reports. The CHRE acts like a buffer between the Department of Health and the regulatory bodies to prevent the regulators being accused of protecting their own. Now the Government has told the CHRE that it has to fund itself in the future so they are hoping to be funded by the health regulators so dont expect them to bite the hand that is about to start feeding them. This is why I have made my complaint the way I have. The Information Commissioners Office say the GCC have a case to answer as do the people who regulate investigatory powers. My MP has passed the complaint to the Justice ministers office (Ken Clarke) there is no question they have a case to answer but the GCC dont have a credible process to deal with a complaint, they have not even acknowledged receiving the complaint. This is not just my experience, Rod McMillian has tried many times to get someone to investigate his many complaints about Margaret Coats and Greg Price. Dana Greene and a number of other former council members have tried to get the CHRE to investigate a number of issues. This is the letter Dana Greene sent to GCC council members after her retirement from council in 2007. I tried a number of times to have it on the agenda of a closed council meeting Peter Dixon refused, Judith Worthington who was his deputy told me it was best to leave Greg Price alone. Margaret Coats gave me dirty looks. Below is the letter the CHRE sent Dana and other former council members regarding their concerns about the GCC. There is only one way to deal with the GCC and its to withhold registration fees. The UK chiropractic profession may have to face up to the fact that it has not been able to regulate itself and chiropractors are unlikely to alter their prejudices. So……CHRE, which was set up by the government to regulate the regulators, only deals with complaints that promote the safety of patients. Even more astounding is that ‘these matters have been addressed by the GCC’. 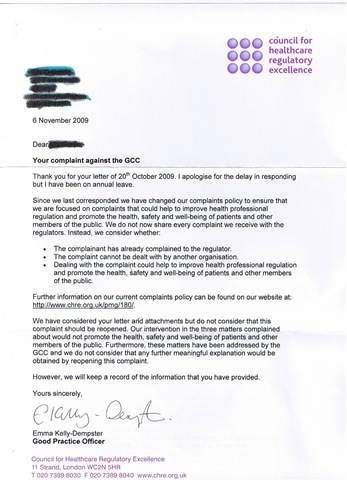 So that’s all right then: the GCC investigates complaints against itself and is answerable to no one.